22a. [Double feature about the Arctic Ocean? ], FROZEN WATERWORLD. 38a. [… about the search for extraterrestrial life? ], ALIEN CONTACT. That’s basically the plot of Contact. 49a. [… about baseball-sized hail? ], TITANIC SKYFALL. Crikey! 67a. [… about Lee Harvey Oswald not being the lone gunman? ], BIG CONSPIRACY THEORY. The Big doesn’t substantially change the Conspiracy Theory angle. 87a. [… about attending a funeral? ], SAW THE DEPARTED. 96a. [… about an insomniac? ], ROCKY SLEEPER. 116a. [… about Pablo Escobar? ], NOTORIOUS KINGPIN. It’s a basic theme type that I’ve seen before. Google shows me two Alan Arbesfeld puzzles, 2008 New York Sun and 2014 New York Times, both pairing movies that won or were nominated for Best Picture Oscars. The theme here is looser (no Oscar tie-in), and there are presumably nearly endless options for assembling such combos. 52a. [First home? ], UTERUS. I like the clue! 16d. [Stephen King novel with a pyrokinetic character], FIRESTARTER. My first King book! Read it when I was maybe 14. Loved it! 118d. [Thor Heyerdahl craft], RA I. This remains bogus. Besides the Kon-Tiki, Heyerdahl had the Ra and, a year later, the Ra II. The Ra was just the Ra, not Ra I. And there’s an alternative, especially when the crossings are reasonable: Aishwarya Rai. (And let’s be frank, Ra I is a piece of crosswordese junk that nobody has any reason to be familiar with, so it is no less in need of crystal-clear crossings than a person’s name.) She’s a Bollywood star but has been on American TV shows and featured in American magazines. Which would be more interesting to Google: An actual person or a boat that didn’t work out? Besides that RA I option, my picks for worst fill are TER and PART A (I can’t have been the only one who went with PART I first). Overall, the fill’s pretty solid, though. FROZEN WATERWORLD = Ice Age? ALIEN CONTACT = ET The Extraterrestrial? BIG CONSPIRACY THEORY = JFK? SAW THE DEPARTED = The Sixth Sense? NOTORIOUS KINGPIN = The Godfather? That’s clever and fun, rather than “it’s okay, but I’ve seen it done better.” It doesn’t work for ROCKY SLEEPER, because that would be an insomniac rather than Insomnia, but it’s pretty good for all the others. 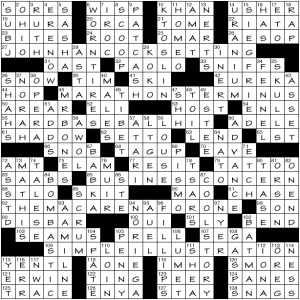 Will Shortz comments that those aren’t the theme clues that were submitted when he received the puzzle. Thanks for the birthday present, Evan! I love it when the theme doesn’t make the puzzle easier. This is the toughest non-meta puzzle I’ve done since Evan took over the Post gig. Great fun. We have book titles scattered around the grid. There’s no trick with these. 27a [With 115 Across, 2014 novel in the “Vampire Chronicles” series] = PRINCE LESTAT. I thought maybe “writer’s block” had something to do with the titles being split up. 41a [1983 horror novel nominated for a World Fantasy Award] = PET SEMATARY. Nope. That one’s all together. 58a [15th installment in the “Goosebumps” series] = YOU CAN’T SCARE ME. Something to with scary books? 82a [2015 novel originally completed in 1957] = GO SET A WATCHMAN. I don’t think this is a scary book in the same category as the others. Hmm. 99a [Children’s book about a mystical woman who grants secret wishes] = THE MOON LADY. I’ve never heard of this book. Meanwhile, there’s something funny going on with some of the non-theme fill – or at least what appeared to be non-theme fill. 13d [One of a deadly seven] was obviously SIN. Except that 25a [Dwight’s opponent] was just as obviously ADLAI, so that didn’t work. I ended up with AVA from crossings. Huh? 37d [Low-calorie snack] = CAKE. Would that it were so. 28 a [Benedick’s love in “Much Ado About Nothing”] is BEATRICE, except there are only four letters. Now what? 30a is on the other side of the single black square after BEAT. The clue is [Southern US region known for growing an important cash crop] and the answer turned out to be BELT. A-ha! If we put RICE in the square, we get BEATRICE, RICE BELT, AVARICE and RICE CAKE. Anne Rice wrote PRINCE LESTAT. She’s the WRITER in the BLOCK. Double AHA. And a little chortle for good measure. Amy TAN (The Moon Lady) turns up in 72a, TAN LINE [10 down acquisition] where 10d is SUNBATH. She also connects to 55d, ARCTAN [Inverse trig function] and 78d TANDEM [Type of bicycle] as well as 70a TRISTAN [Title tenor for Wagner]. Stephen KING (Pet Sematary) is part of LION KING at 86 d [With “The,” hit musical based on a Disney film] and 210d KINGDOM [Ruler’s place]. The quartet is rounded out with 110a SPARKING [Kindling] and 113a KINGPINS [Top dogs]. R. L. STINE (You Can’t Scare Me) is at the bottom right, with 109a ERNESTINE [Lily Tomlin’s Laugh-In operator character] and 132a PALESTINE [One of two non-member observer states at the U.N.]. Not only did Evan fit the authors and the books into the grid, but the words that are left when the writer’s name is removed are all actual words. Two of the (TRIS and AVA) are names, but I don’t care. It’s a dense, tricky, clever theme, and it works brilliantly. It’s an ORCA contender, for sure. Stephen King and Amy Tan are members of the Rock Bottom Remainders, a band made up of published authors. I wondered if there was yet another layer to this theme and looked up the roster – nope. That would have been too much to expect of even this remarkable puzzle. Before I figured out that the hidden words were all writers, I thought there might be a MO at the end of SATCH at 8d [Jazz legend, to fans.] Nope. I hear the clue and the answer at 85 a in a New York accent – [“You expected a different person?] = WHO ELSE. I might have said “You expected maybe a different person?” but I’ll take it. 44a [It’s high in New York] refers to the RENT. Of course. What I didn’t know before I did this puzzle: that there was an animal called the RHEBOK – 48a [Animal whose name is the origin of a shoe brand] I’m glad they simplified the spelling. Good morning, everyone! Whew, after a week of running around, it’s good to be back in New York and blogging from the comforts of my own apartment. What wasn’t so comfortable was my seat on the airplane on which I did this puzzle flying back to New York yesterday evening. 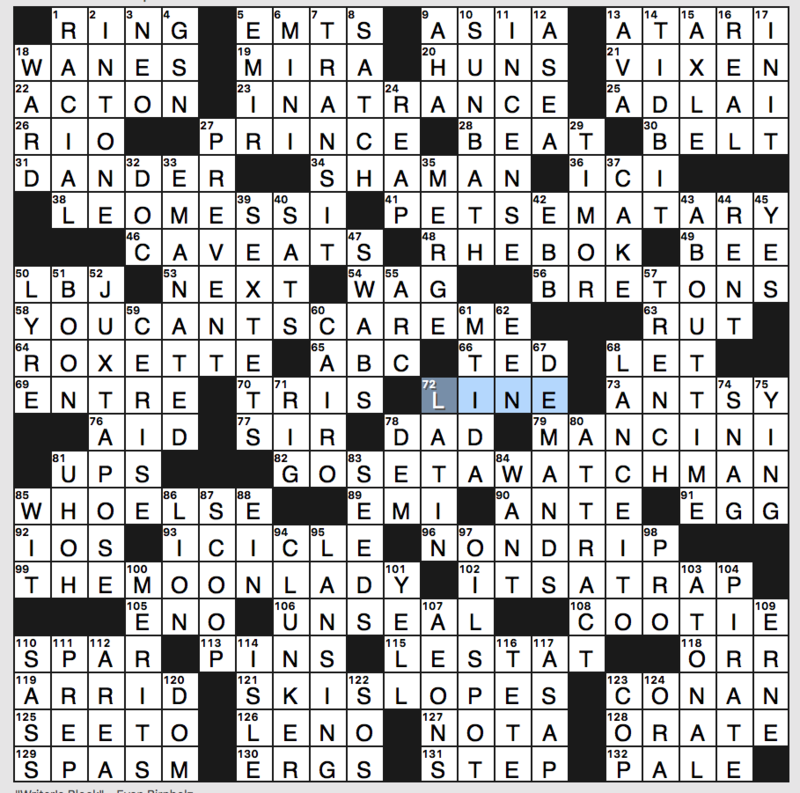 At least this 6’4″ crossword blogger wasn’t sitting in the middle seat, right? Today’s crossword puzzle was brought to us by Mr. Bruce Venzke, and this was a very comfortable solve to say the least. Love the fill, despite it playing pretty easy. Can’t say that I’ve ever played LIAR’S DICE, but always wanted to use the cups the dice are in and play when I’ve seen people play (21D: [Bar game played for drinks and involving deception]). Anyone on here ever play it? Probably had only one real hangup when solving, and that was when I put in “singlet,” which is used in wrestling, instead of UNITARD (18A: [Gymnast’s garment]). There were a couple of clunkers as fill, including MOISTER, which just sounds so unsexy when saying it out loud (1D: [Less arid]). But then there’s LASAGNA, and a reference to Garfield – my favorite comic strip – in its clue, and that made up for it (39D: [Garfield’s favorite food]). Oh, and here’s hoping you watched the opening of the ESPYS, with four of the best basketball players – Carmelo Anthony, Chris Paul, Dwyane Wade and LeBron James – delivering powerful messages in response to the recent violence/injustice that was a flashpoint in this country the past week (31A: [Sports awards since 1993]). Hope you got to see it. “Sports will make you smarter” moment of the day: STILT (20A: [Basketball’s Wilt the _____]) – For those who don’t know, the man known as “Wilt the STILT” is none other than the great Wilt Chamberlain, the seven-foot giant who revolutionized the game of basketball, whether when he was at the University of Kansas or in the NBA. His most memorable achievement occurred on Mar. 2, 1962, when, in a single game, he scored 100 points for the Philadelphia Warriors in a win over the New York Knicks. His exploits were often overshadowed by the near-endless championships that his team’s rival, the Boston Celtics, won during that time, but Wilt was as good as anyone who ever played the game. 23a, LUMINOUS FEINT [Brilliant bit of deception?]. Luminous paint. 37a, QUIET FLEAS [Taciturn circus entertainers?]. Quiet, please. 66a, JURY OF ONE’S FEARS [Panel judging phobic reactions?]. Jury of one’s peers. 95a, NOBEL FRIES [Award ceremony side dish?]. Nobel Prize. 113a, FADE BY THE HOUR [Gradually doze during a long meeting?]. Paid by the hour. 14d, ALLIGATOR FARE [Charge in an Everglades water taxi?]. Alligator pear. The first theme answer I filled in, which gave me the theme. 56d, FARRAH SAILING [“Charlie’s Angels” actress on her sloop?]. Parasailing. I really like this theme, and all the theme answers are very good. 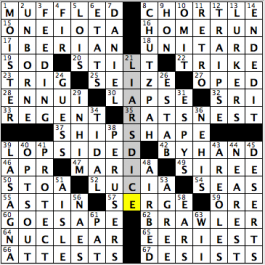 The fill is very solid overall, though if I could wipe HOT’L and AEDES from the crossword universe, I would gladly do so. EROO and AROO, also not my favorites. Does anyone here say “AND SIGN” to mean “ampersand”? OK, I’m heading out to enjoy a beautiful Sunday in New York. Until next time! In which the blanks of minimalist fill-in-the-blank clues are, literally, lines. Additionally, the answers read more like clues, and vice-versa. 27a. [Dotted ___ ] JOHN HANCOCK SETTING. 45a. [Finish ___ ] MARATHON TERMINUS. 55a. [ ___ drive] HARD BASEBALL HIT. 85a. [Bottom ___ ] BUSINESS CONCERN. 92a. [ ___ dance] THE MACARENA, FOR ONE. 109a. [ ___ drawing] SIMPLE ILLUSTRATION. Only six themers, but they’re all quite long. I can live with that. Hardest and therefore final section to complete was in the northern California/10 o’clock spot. Took forever to relinquish ROSIE from 37d [TV host O’Donnell], not having ever heard of NORAH. Combined with the odd AREAR (see below) and uncertainty whether 36a [Coke is it] was SNOW or BLOW, it led me to question much of the other fill in that block. Handful of icky fill. My least favorites: 50a [Toward the back] AREAR, 77a [Change chairs] RESIT. and the accumulation of abbrevs, particularly 58d LT GEN, 1d SUBJ, 72d ASSTD, 54a ENLS, 113d OREG. Also, the combo of 88a [Norman invasion town] ST LO and 86d [Mlle. with a halo] STE. Clues that may need explaining: 87d [Bro’s anecdote] COOL STORY. 23a [Couple of apps] BITES, ‘apps’ as ‘appetizers’. 41a [Use the Nordicas] SKI, odd-looking plural of a brand name. 20a [Boat-wrecking beast] ORCA. Huh? This entry was posted in Daily Puzzles and tagged Brendan Emmett Quigley, Bruce Venzke, Evan Birnholz, Jerry Miccolis, Matt McKinley. Bookmark the permalink. How was 67a not JFK CONSPIRACY THEORY? I mean JFK was about a conspiracy theory, but as noted by the blogger, that didn’t stop them on ALIEN CONTACT. There’s also RAI, the Italian national broadcasting company. As one of the people who gave the NYT puzzle a low rating, I would like to offer condolences to the constructor after reading the postscript explanation published on Rex Parker’s blog (and possibly/hopefully on this site by the time people read this comment). Completely incomprehensible editing changes. Still some dodgy fill but I believe the theme would have been much much better in the original. 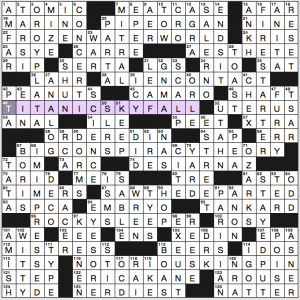 Even the original version of the NYT would not have thrilled me very much, since I am not a movie person and had only a vague sense of most of the titles, but there would at least have been an interesting twist that was totally missing in the puzzle as issued. 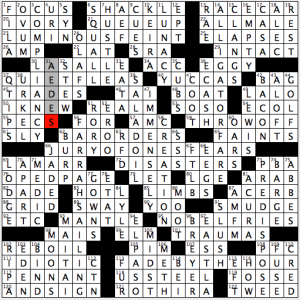 The journey of today’s NYT crossword as reported is a travesty. I was hoping you would offer more of an explanation about the use of the FITB underscore in the clues. In this case I don’t think that’s what it means. I understand them to be a visual representation for the word “line”. I’m not at all sure why he just didn’t type in the word line for all the clues. I totally agree with your befuddlement at orcas destroying boats. I thought I did convey that about the lines. No? Thanks, Jenni. And happy birthday! I thought of the idea a few weeks ago when I was stuck thinking of other ideas, appropriately enough. Brilliant puzzle. Three four-way invisible rebuses plus the two corner square two-ways. And everything symmetrical. Just tremendous. This is the first of Evan’s puzzles I haven’t really loved…since he began his great tenure at the Sunday Washington Post spot where Merl shined for so long. 50% of the reason is the puzzle’s difficulty which was made immeasurably more so by not being able to read the clues, across and down numbers, etc. Something changed a few weeks ago for those of us who print out the puzzle from the Post puzzle page. Evan’s crossword prints out in a very small font taking up less than 3/4’s of a letter sized page. If someone can notify the Post person responsible or has a solution for a readable-sized, non-blurry printed puzzle, please tell me. I tried zooming it. Little luck. Thanks. Keep up the great work, Evan. P.S. Someone at the Post must have discovered the technical problem. Since printing out Evan’s puzzle yesterday, it now prints correctly with a readable font. Thanks to whomever. So…never mind ;-). Not knowing much about music, I was pretty confused by LAT puzzle until I read Matt’s explanation. Thanks, Matt! I say “and sign” for ampersand. Don’t feel bad , Karen. There was no way that I would have ever figured that out, and I’ll bet that most people would never get it. To relate crescendo as going from soft to loud is one thing, but then equating that to going from piano to forte, or “p” to “f” is a little too much for me. Doo-wop music is my favorite, and we don’t talk like that! I am now very confused about the NYT, but the use of a third movie to clue the two put together would have been really cool. 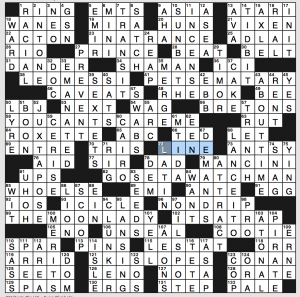 For the LAT, I agree with Andy that the theme was nicely crafted and continue to be amazed at whoever keeps grading puzzles as 1. If you are going to suggest a puzzle is the lowest form, you should make some comment on the basis of such an opinion. Perhaps the grading system could adopt the Olympic gymnastics stance of throwing out the highest and the lowest rating. …or throwing out the rating system entirely. Papa John – You don’t think that would take just a little something away from judged sports? I thought we talking about crosswords being rated, not sports. Delighted from Rex Parker to learn about the original puzzle. Delightful, and what a shame they didn’t use it. I won’t apologize one bit for a low rating on this one, IMHO one of the worst I’ve ever seen. I got the theme quickly, but agree with those who find it way too trite and easy on the setter, since one can always find movies to make out anything. The ones here were often minor or childish to the point of not remembering as well, with some forced clues. And then the piling on of trivial clues just made things worse. Right in the NW, I faced not just the (ugh) Disney movie I’d have tuned out, but the baseball player from old times (who knew? ), the football player, the AIDS organization (new to me, and I’m editing a health science textbook), and chemical ending, which could define practically anything. I could go on at length about pretty much every corner of the puzzle. This one just seemed WAY to easy to construct, and the answers weren’t all that interesting either. Stringing movie titles together…meh. 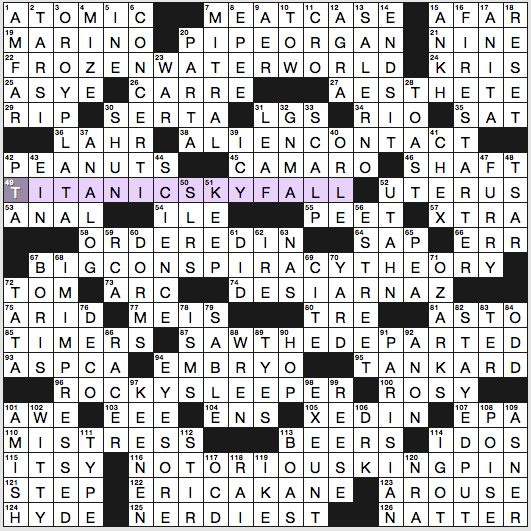 I was actually working on a similar puzzle, except the titles had to blend together (example: comdienne heckled – Answer: Funny Girl Interrupted). Of course, now that idea goes into the circular file. Oh well…. Do other editors (Tausig, Gordon, etc) give constructors this little input say when major editorial changes are proposed? 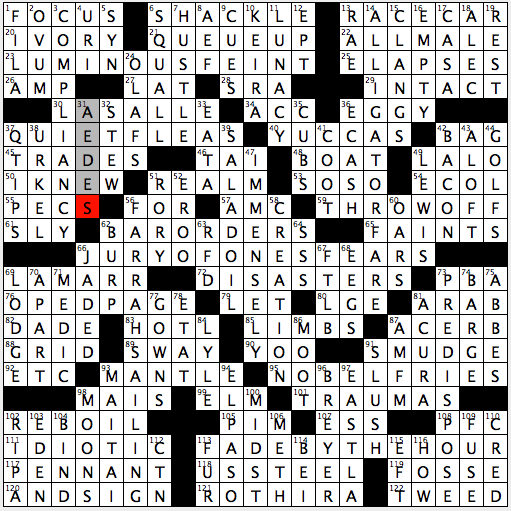 Or is “my crossword showed up very changed” a uniquely NYT experience?